VIMS Professor Emeritus Willard A. Van Engel received an honorary doctorate of science during commencement ceremonies at The College of William and Mary on Sunday. 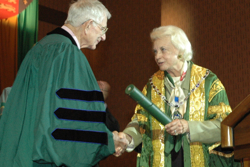 The doctorate was presented by W&M Chancellor Sandra Day O'Connor. Van Engel is credited with being one of the individuals responsible for the creation of the Virginia Institute of Marine Science, when in the mid-1940s he and colleagues at the Virginia Fisheries Laboratory developed the scientific community that later became VIMS. Van Engel conducted research and taught at VIMS until 1985 when he retired at age 70. Upon retirement, he had dedicated 39 years of his life to VIMS and its School of Marine Science. Van Engel, also known as "Van," led the way with cutting-edge research in the Chesapeake Bay and was a pioneer in many marine science research areas, including his seminal work on blue crabs and the blue-crab fishery. He helped found the Atlantic Estuarine Research Society (AERS) in 1949 and served as its inaugural Secretary-Treasurer. Van Engel is also credited with first recognizing the need for keeping duplicates and reprints of scientific papers and reports in one centralized location—an effort that grew to become the VIMS Library. He has also been a strong supporter of the college and his generosity has allowed for the Van Engel Graduate Fellowship and VIMS Library to continue in perpetuity. In 2003, VIMS awarded Van Engel with its first ever Lifetime Achievement Award for his outstanding contributions to the state and the college. At that time, William W. Warner, author of the blue crab classic "Beautiful Swimmers," called Van Engel "the complete estuaries biologist, as much at home in theoretical discussions with his scientist colleagues as he is in meeting with watermen throughout the Bay." Van Engel grew up in Wisconsin and attended high school in Milwaukee before serving in the U.S. Air Force. He earned bachelor's (Ph.B) and master's (Ph.M.) degrees in philosophy from the University of Wisconsin at Madison.